IT’S BEGINNING TO LOOK A LOT LIKE CHRISTMAS! 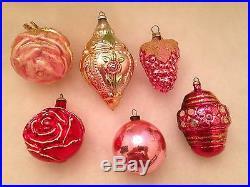 SIX VINTAGE GLASS CHRISTMAS TREE ORNAMENTS. GERMANY, ITALY AND JAPAN. 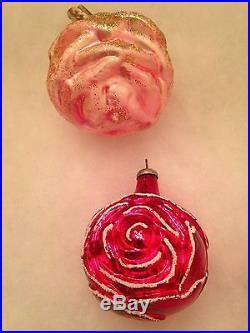 DELICATE HAND-CRAFTED HAND-BLOWN GLASS ORNAMENTS. SUCH BEAUTIFUL SHADES OF PINK. LARGE PINK CLIP ON ROSE WITH DELICATE SUGAR GLITTER. EMBOSSED ROSE DESIGN ON ONE SIDE. VICTORIAN LADY ON REVERSE SIDE. BUNCH OF PINK GRAPES. LEAVES ON THE TOP ARE SPRINKLED WITH GLITTER. NO CHIP in the pike it appears to be but it is a loss of the glitter. PINK GRAPES ON THE BOTTOM. PETALS ARE SPRINKLED WITH WHITE GLITTER. EMBOSSED ROSY PINK ORNAMENT. RAISED ROSES AROUND THE CENTER. GROOVED LINES SPRINKLED WITH GOLD GLITTER. MADE IN ITALY (ITALY STAMPED ON PIKE). RARE and HARD TO FIND. ALL IN WONDERFUL VINTAGE CONDITION. NO CHIPS OR CRACKS. ITEMS WILL BE INDIVIDUALLY WRAPPED WITH TISSUE AND BUBBLE WRAP. We have taken 7 photos of the ornaments (please take a look at all photos and also enlarge them to get a better idea of the excellent condition of these ornaments before deciding). These ornaments are used. They will show signs of usage, storage and aging. Th ere will be scratches, discolorations and oxidation of the paint. This is expected in vintage Christmas Ornaments. These ornaments are in wonderful vintage condition. There are no issues at all. They will be a great addition to your vintage Christmas tree ornament collection. Most people who get the bug for collecting Vintage Christmas Ornaments start out with the easy tree ornaments and other Christmas collectibles often handed down from grandparents and parents. Others find a collection at a tag or yard sale and so it begins. You add one or several ornaments each year and slowly the collection begins. The joy is in fact actually being able to display your Vintage Christmas Ornament Collection each year and eventually passing them down to your own children and grandchildren. 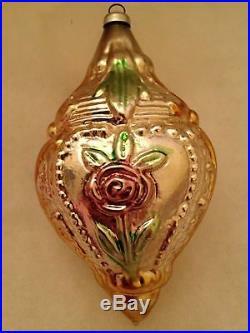 They also make cherished Christmas gifts that can last an entire lifetime when given by one family member to another. Glass Christmas Tree Ornaments from the 1930’s, 1940’s and 1950 are by far extremely popular these days with collectors. They can fetch prices as low as twenty dollars all the way up to several hundred dollars for some of the rarer pieces. Because these are true relics from the past, all have some signs of wear which may include light scratches, surface wear, spots of paint loss and areas of discoloration. This is part of the vintage charm! Messages if you have any question. THE COUNTDOWN TO CHRISTMAS HAS BEGUN! 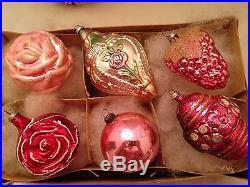 We will be listing many more beautiful VINTAGE CHRISTMAS ORNAMENT so please check back every so often to see what’s new! Thank you for your continued patronage. 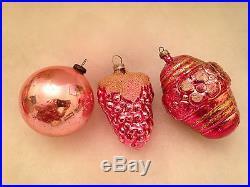 The item “6 Pink Vintage Glass Christmas Tree Ornaments Germany Italy Japan” is in sale since Monday, October 17, 2016. 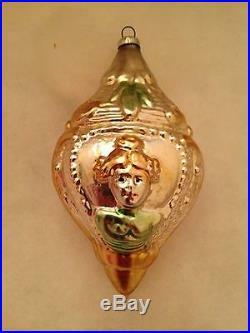 This item is in the category “Collectibles\Holiday & Seasonal\Christmas\ Modern (1946-90)\Ornaments\Glass, Crystal”. The seller is “olde_time_christmas” and is located in Bronx, New York. This item can be shipped to United States.